Change is hard. Or, as my good friend Doug puts it, "momentum is a hell of a thing." It is somewhat ironic that humans, a species whose survival over thousands of years has relied on adaptation, tends to resist and even fear change. There will always be leaders who bring about change and stimulate those around them to think differently. Gandhi was one. Steve Jobs, Elon Musk, and Bill Gates are all modern day examples of this. They, like many before them, took risks, pioneered new ways of thinking, and have shaped a generation. A couple weeks ago, I was at the Inc 5000 conference in Phoenix. It was amazing to be surrounded by other entrepreneurs. Inspiration was everwhere (and Alessandra and Tatiana wrote a blog post documenting it with some pictures I took). There, I was surrounded by agents of change. They are leaders who see ways to make the world a better place, and believe in themselves enough to be that change. One of the most moving talks I saw was given by Hamdi Ulukaya, a Turkish immigrant who founded a little company called Chobani yogurt. The man is incredible. The courage it took to start that company, and the humility he shows even today with a billion dollar company under his command, is nothing short of amazing. He started from nothing and built something incredible. Many stories about entrepreneurship start that way. I remember what it was like starting my first company, CoolerEmail, the predecessor to GreenRope. It was an email marketing company that I co-founded in 2000. I had saved up a few thousand dollars from my time in the Air Force and moved from Albuquerque to a small town north of San Diego, in southern California. I had an idea, but no idea how to bring it to fruition. It took years of working part-time, writing software in the early days of the Internet for other companies, before I was comfortable enough to devote 100% of my time to that new business. In those years, there was a lot of a mac and cheese, many nights of Top Ramen, and working until 2am in front of my computer, trying to figure out how to build the best email marketing system I could. I remember many nights when friends would ask me to go out for a beer, but out of my own fear of failure told them (repeatedly), "not this time, maybe next week." I was never the party guy, almost always the sober driver, always the "responsible one" watching out for my friends to make sure they all got home safely. I credit most of that to my upbringing. My parents were always pretty strict and instilled in me a sense of discipline that was strengthened by my years in the military. Leaving Uncle Sam to start my own company meant I had to apply what I learned from my parents and commanding officers to an uncharted territory of business. I'm not going to lie - it was scary. I mean like "I've been up for 48 hours and I'm afraid to fall asleep because what if I missed something" scary. Anyone who has started a business knows this fear. Fear of failure, fear of letting down customers, fear of competitors taking your business away. Coming to grips with that fear and learning to live with it is one of the hardest things anyone who is trying to create change will find. "Fear is the mind killer" is one of my favorite quotes from Dune (the movie - I never had the time to read Frank Herbert's massive epic novel). Discipline is the only thing that overcomes fear and creates action instead of paralysis. Sometimes mistakes can feed the fear demon. I remember something that happened about 12 years ago, when we were just a fledgling startup, and someone created an account with a stolen credit card from an Internet cafe in Lagos, Nigeria. He uploaded a list of several thousand email addresses and sent out a phishing email from our servers. It was gut-wrenching to wake up in the morning and see the fallout from that. It was ugly, it tore at my psyche, and it was rude awakening to the way many people in this world operate. Right or wrong, he exposed a vulnerability to our way of thinking, one that we have since corrected with one of the tightest anti-spam and data security policies in the industry. He taught me a lesson in carefully extending trust to the anonymous world of the Internet. While I am grateful for the lesson, I didn't sleep for a week. One of my best friends once told me a useful way to deal with fear and open the door for discpline and action. First, you recognize your fear as a separate thing. It's not you. It's a feeling. We all have fear built in to our psyches as self-defense mechanisms, so we never just ignore it. But that doesn't mean it controls us. My friend Jason taught me to think of my fear as a physical object. You can pick it up, hold it in your hand, look at it, and then decide what you want to do with it. You can put it in a box, you can look away from it, or you can choose to look directly at it. But no matter what, you don't let your fear drive you to do something you don't want to do. Conquering fear opens the door to discipline, to action. My own personal greatest fear is that of failure. If anyone ever feels like they haven't had a positive experience with me, in both my personal or professional life, I internalize that and it makes me wonder what I could have done to prevent that failure. That same fear of failure is what drives me to work until 2am some nights, programming, writing, thinking of ways to improve GreenRope and generate more awareness about who we are and what we do. After 14 years of living with this entrepreneurial fear of failure, I'm a little better at balancing the impact that fear has on my day-to-day life. I know there are some things I can control, and other things I can't. It doesn't mean there's no stress, just that I have learned to accept it. Without a doubt, sacrifices have been and will continue to be made. Sacrifice is something every business owner learns to be comfortable with, driven by the desire to create something amazing in the world. At GreenRope, those same ethics of discipline and caring about the users of our platform are at the core of our company culture. 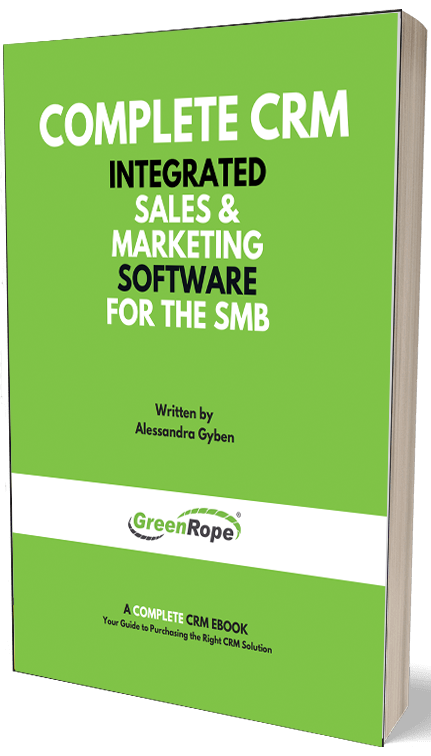 Every single person genuinely wants every GreenRope user to be happy with our platform, to learn how to use it to grow their business, and make their vision of growth a reality. We are a small company, and intentionally so. After many years of learning and focusing on helping our clients, we have built an environment that serves them. On average, GreenRope clients grow their top line revenue 75% in the first 12 months (an independent statistic collected by a company that interviewed actual clients). We want that number to always get bigger, always help our clients grow, run more efficiently, and unify their teams into common purpose. But it always takes change. The status quo doesn't create that kind of growth. The idea of change means that we accept fear for the prospect of making ourselves and our organizations better. We accept that there will be work, that we will use discipline to conquer our fear. GreenRope represents more than software. It represents a new way of thinking about running your organization. One in which everything is unified, removing barriers, and creating efficiency. It also means everyone involved has to care and contribute. Organizations grow when people grow. They die when people stop learning and stop trying to improve the way business is done.